The best season to sow Ariocarpus seeds is in spring because this is the growing season. However, if you do not wish to wait until that season, you can plant the seeds through induced artificial climate. You have to option at the moment of selecting the container to sow the seeds, a seed tray or a pot. There are two kinds of flowerpots, clay pots, and plastic pots. Choosing the right will depend on the soil you are using; clay pots dry out very fast while plastic containers keep the substrate moist during a longer time. Besides that, when choosing a flowerpot, keep in mind to select one that is wide and not long, a pot of 10 cm (3.93 in). As always, the perfect soil must have good drainage. When preparing the substrate do not use a potting mix because Ariocarpus do not like, strictly use the cactus mix with perlite, sand, peat vermiculite, or any other rich organic material that makes the soil porous. Remember to sterilize the soil before planting. Once you sterilize the soil, proceed to fill the pot with it, and moist the substrate. Spread the seeds all over the substrate, do not bury them just spread. It is an optional step to apply an additional layer of substrate (1 cm- 0,39 cm). Cover the pot with a plastic wrap, a glass sheet, a white paper, or a plastic bag. Put the seeds in a light shadow place. The seedlings should appear in twelve or fourteen days. When this happens, remove the cover. It is time for the seedlings to meet the sun, to do that you must put them in direct sunlight a few minutes every day. Do this process gradually you may increase the time you let them in direct sunlight when the weeks pass. Once the seedlings are accustomed to the sun, move them to a sunny place. If you sowed in a seed tray, wait three or four weeks to start the transplanting process. Note that you should try to realize this process during the growing season to obtain better results. Do not forget to sterilize the new substrate, neither to remove the old soil from the roots of the plants. Watering: during winter water is restringed because the humidity of winter is enough to keep the soil of the plants moist if you decide to water the plants during this season, it is an unwise decision. When the spring comes, the growing season arrives, so they need more water to grow strong. Water them every time the soil is dry, to know when it is dry sink your finger into the substrate. The same applies to summer and fall. Light: these plants love direct sunlight as long as the sun is not too intense. In countries where the sun is like that, the most recommendable is put the plant in a light shadow, the same applies to countries where there is sun but continuous rainwater. During winter the plants need to receive at least two hours of sun every day, but be aware of any water drop fall on the plant. Fertilizer: apply it during its growing season (spring). Remember that the best fertilizer not only must work with cactus also it must have low levels of nitrogen because if not, the plants will also have a later bloom. 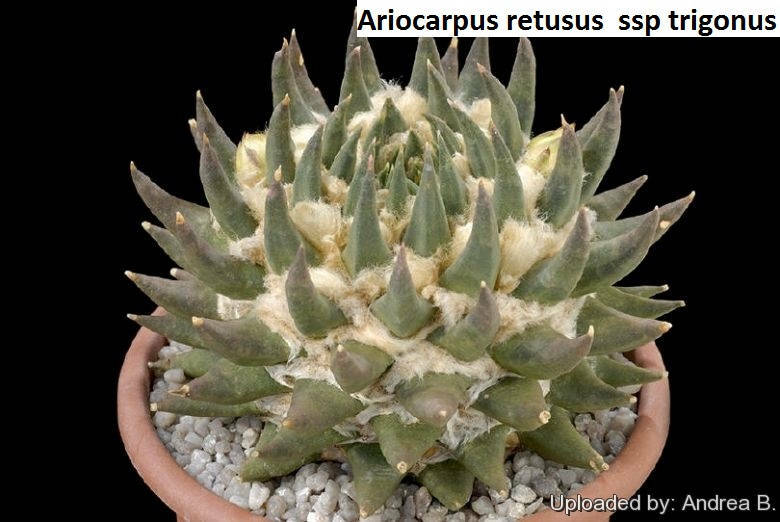 Temperature: the Ariocarpus love not too warm temperatures, they are more to the cold side. The average temperature for them is 10º C – 15º C (50º F – 59º F). If they are in warm climates is likely they will die. Pests and Diseases: rotten roots are the first disease they can suffer, all of this due to overwatering. Apart from that, mealybugs as well as others minimal insect can attack your plant. In this cases, opt for using a light insecticide once a week.